Shop with a List – Don’t go to the store without a grocery list, and group items according to the sections of the store where they are sold. By keeping such a list posted on the refrigerator or in the pantry, you can add to it as you use up supplies or notice them running low. Print a copy of our list or design your one of own. Stock Your Pantry – Keep ingredients on hand for several quick and easy meals (eg. taco soup, cheese enchiladas), so that you can have a simple meal ready on short notice in case your husband gets home early or unexpected company drops by. Quick Recipes. Make a Menu – Plan the week’s menu before heading to the grocery store. This will allow you to take full advantage of special sales, eliminate the need for subsequent trips to the store for forgotten items, and reduce the daily thought needed to get dinner on the table. Keep Track of Wash Cycles – Have you ever had a child empty an entire dishwasher before it actually been run? If you don’t like dirty dishes being put back in the cabinet with clean ones, try our handy trick. We use a dry erase marker to write the word “dirty” on the inside of the dishwasher door each time it has been emptied. The word stays there until the washer is run again, then rinses clean with the dishes. This tip works best with stainless steel interiors. If your dishwasher door is made of something else, test first to make sure mark will erase. If not, use a moistened stick of colored chalk, instead. Use Logic and Labels – Store things in cabinets closest to the point of use – cups near the sink or dishwasher; plates and silverware near the dining table; pots and pans near the cook top, etc. Label all shelves, drawers, dividers, etc. so that things can be easily returned to their proper places, even when someone besides Mom is putting them away. 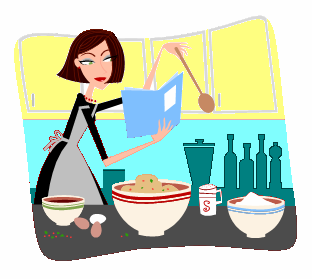 Create Work Stations – Likewise, try to group items in activity centers – keep mixing bowls, measuring cups, measuring spoons, baking pans, flour, sugar, oil, etc. easily accessible from a baking center. Other centers could include desk area (pens, pencils, paper, envelopes, stamps, labels, stapler, scissors, etc) or coffee center (coffee maker, filters, coffee, sugar, creamer, etc.). Keep Tools Handy – Hang measuring cups/spoons on inside of spice cabinet door. Post Favorite Recipes – Post frequently used recipes (eg. for muffins or pancakes) on inside of cabinet door. Make a Message Center – Keep a notepad and pen near the phone. Use Your Crockpot – Buy a slow-cooker and use it to have meals ready anytime – start early in the morning (eg, pot roast, carrots and potatoes, plus a can of cream of mushroom soup and a pkg. of onion soup mix). Cook in Bulk – Double up when cooking any dish that freezes well and save half for another day or to share with friends who have a sickness or death in their family. Safeguard the Cookie Jar – Install a flip lock on the pantry door to keep little ones from getting into things without permission (I also use these on closets used to store toys, costumes, Christmas decorations, etc.). Use Storage Containers – Keep the pantry looking neat by storing cereals, snacks, and staples in Tupperware or recycled plastic jars with wide, screw-on lids. This allows you to spot at a glance when you are low on flour, sugar, or Cheerios. Air-tight lids also keep freshness in and bugs out. absolutely love my Tupperware Modular Mates for this, so much so I started offering Tupperware to others thru my website! I use fridgesmarts in our refrigerator as it helps foods stay fresher longer, no losing produce that isn’t eaten up quickly. Freezermates in the freezer, new ones do not stain! and the best part is the lifetime warranty, sure beats spending money repeatedly for plastic sold in the store that you have to keep buying or ziplock bags you have to keep buying, so saves us money big time! I’m with you on the Modular Mates, Linda. They keep everything so fresh and neat in the pantry. May have to try the new Freezermates, although we usually go through our produce pretty quick around our house with all the mouths we have to feed! Thanks for all your print outs. I needed a menu planner and knew you’d have one! We use many of the others too. Flanders Family Info ROCKS!! !